Because I’m basically a coward, I’m reluctant to keep wading into the TSA screening debate. But that’s not the only reason. It’s also because this is not a subject where I have a lot of confidence that I’m right. Maybe it is all just useless security theater! All I can say is that when something like this turns into a feeding frenzy of almost universal scorn and mockery, largely driven by the Drudge/Fox noise machine, my BS radar starts clanging. Matt Yglesias: If you assume the existence of a person willing to die for Osama bin Laden’s war on America, located within the United States of America, and in possession of a working explosive or firearm, there’s basically nothing stopping him from blowing up the 4/5/6 platform at Union Square or the 54 bus in DC…. [So] don’t ask yourself “what amount of hassle and expenditure is worth paying to prevent terrorist attacks,” ask yourself “what amount of hassle and expenditure is worth paying to shift terrorist attacks off airplanes and onto buses”? Me: This is extremely logical. But it also seems to be wrong. For whatever reason, Islamic terrorists have a long and tenacious obsession with air travel. For the past decade it’s been way harder to blow up an airplane than the 54 bus, but they keep trying to blow up airplanes anyway. That’s just the reality we have to deal with. Will Wilkinson: So do you think all this jazz actually has/does keep people from dying in/from planes? Me: Well, yeah. Obviously this isn’t something that I can prove geometrically, but that’s baked into the cake of security issues like this where your goal is to prevent people from even trying to blow things up in the first place. Still, we’ve made it very, very hard to bring explosives onto airplanes, and I think it makes sense to believe that if we hadn’t made it so hard more people would have tried it. For example, my guess is that the reason no one has tried a shoe bomb since Richard Reid’s failed attempt is that everyone knows it won’t work. Shoes are now x-rayed, so there’s no point in trying. randomsubu: OK *IF* backscatter images reliably destroyed/not photographs. Otherwise…. The systems are designed without any capability of storing, saving or otherwise archiving any images or data that are taken from the checkpoint. Finally, we are releasing in the next few months … a threat-recognition upgrade where the system never even uses an image. 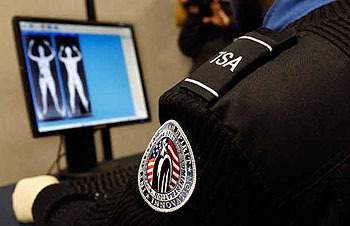 It just automatically detects any anomaly on the body and directs the [Transportation Security Administration] officer where on the body to ask the passenger, “What’s in your back pocket?” or whatever. No image is ever created or used of the passenger — and that is only a couple of months away from being available. The scans that were famously saved and distributed in Florida were not done by Rapiscan devices and have nothing to do with airport security. Reader PJC via email: This also raises another potent issue — TSA actions creating, rather than obviating, terrorist options. The more we have to strip down, pat down, stand in multiple lines for multiple machines, the longer and slower the lines get. Right now, the best option for a terrorist attack (and I’m surprised it hasn’t happened already) is actually the security line into the terminal. You could easily enter a terminal with an automatic weapon or a bomb without anyone knowing since you will not have hit the security scanners yet. Then you blow up or shoot everyone waiting in line, hemmed in by the rope barriers so they can’t easily escape. One backpack filled with C4 and nails. That’s all it takes. What do we do then? Hide under the blankets? Will we randomly scan anyone within a mile of the airport? Me: Again, this is perfectly logical, and a lot of people have made exactly this point before. But in real life this hasn’t turned out to be a big target for terrorists. Not dramatic enough, I suppose. In any case, I’ve flown regularly since 9/11, and except for the first year, before airports had adjusted to the new protocols, lines don’t seem to have gotten much longer. What’s more, a bomb in a security line can only kill just so many people. Once you have 20 or 30 people lined up, you’ve pretty much exhausted the killing power of your basic backpack explosive device. Melissa McEwan: Leaving aside my lack of enthusiasm for the calculation that we should give an inch’s worth of encroachment into our civil liberties in order to stop the government taking a mile […] there are practical and valid objections being made by people with disabilities, parents of children with disabilities, and survivors of sexual violence….Those millions of people are not just potentially “inconvenienced.” Being triggered does not mean feeling hassled or being annoyed or having your feelings hurt or getting upset. It means experiencing a physical and/or emotional response to a survived trauma, having a significantly mood-altering bout of anxiety. Someone who is triggered may experience anything from a brief moment of dizziness, to a shortness of breath and a racing pulse, to a full-blown panic attack. Me: I don’t honestly have a good answer to this. I can’t pretend that I understand what this is like for everyone. However, if anything, the backscatter machines ought to eventually reduce the number of patdowns. What’s more, patdowns have been part of TSA security ever since 9/11, and as I said above, I very much doubt that the “enhanced” versions are justifiable. So unless I hear a pretty good argument from TSA about this, I’d be in favor of returning to the old patdown standards and trying to eliminate some of the pain Melissa is talking about. Stephen Bainbridge: Everybody knows El Al security includes racial and ethnic profiling. So we can’t use it in the USA because profiling would violate the civil liberties of those who get profiled. And that’s how it should be, for both prudential and moral reasons. But instead we have a system that violates everybody’s civil liberties. Excuse me for preferring a system in which nobody’s civil liberties get violated. Me: Part of me agrees with this. But look: there’s a difference between something being annoying and something being a violation of civil liberties. At TSA checkpoints you are now required to take off your shoes. That’s not a violation of civil liberties. You are required to take your laptop out of your bag. Ditto. You are limited to 3-ounce bottles of liquid. Ditto. Your carry-on luggage has to get x-rayed. Ditto. You are required to go through a scanner. Ditto. If you can’t or won’t go through the scanner, you have to, um…..OK, like I said, the super duper patdowns really do seem hard to justify, and if they aren’t technically a violation of civil liberties they’re pretty damn close. But with that exception, I have to say that I don’t really see this stuff as a violation of civil liberties. I don’t like it much, but that doesn’t make it illegal or unconstitutional. I guess that’s enough. I’d add to this list that there are concerns about the radiation exposure from backscatter machines, and I think that deserves to be taken seriously. I can only give my sense from reading what various experts say, but it sounds to me like these concerns are overblown and mostly just tossed out to add another log to the anti-scanner bonfire. But I might be wrong about that. I’m completely in favor of making sure that these machines are thoroughly and independently tested. I’m not really comfortable taking the side of this argument that I’ve ended up taking, and I’m wide open to changing my mind. But the plain fact is that Islamic terrorists really do have a long history of trying to blow up American airplanes, and all the evidence suggests that they’re going to keep trying. Reacting to that makes sense. And for those who suggest a sort of cost-benefit analysis — if we reduce the security and simply accept a few dozen additional deaths each year we’ll come out ahead — I think this is just wildly divorced from the way actual normal human beings react to attacks from other human beings. Maybe us hyperlogical types think that way (I certainly do), but most people just don’t. One final note: I was pretty surprised by the number of tweets and emails I got agreeing with my take on this. It wasn’t a monstrous number, but frankly, I was expecting zero. It wasn’t just mindless save me from the terrorists! stuff either. I suspect there might be more people out there who are OK with stiff airline security protocols than the talking heads are admitting right now.